The VRX events are the globe’s most influential VR & immersive tech business conferences. Join hundreds of major enterprises, investors, huge brands and tech juggernauts to cut through the noise and set your company up for success as immersive reality takes hold in enterprise. 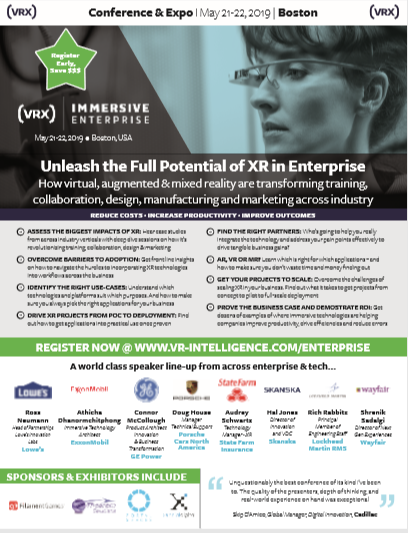 Enter your details on the right to get all the latest news on the VRX Immersive Enterprise event in Boston which will bring together the most senior level network of business leaders working on the deployment of immersive tech across industry in 2019. If you're interested in getting your company involved as a speaker or exhibitor, drop me a line - my full contact details are right here. Please note that any companies providing solutions or services to enterprise will only be considered for speaking as part of event sponsorship. FIND THE RIGHT PARTNERS: Who’s going to help you really integrate the technology and address your pain points effectively to drive tangible business gains?